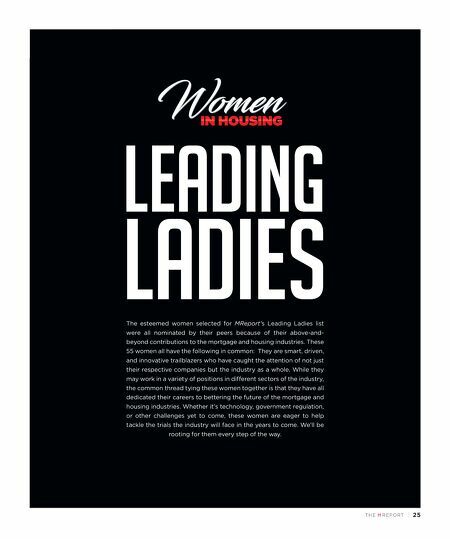 SPECIAL SECTION TH E M R EP O RT | 25 The esteemed women selected for MReport's Leading Ladies list were all nominated by their peers because of their above-and- beyond contributions to the mortgage and housing industries. 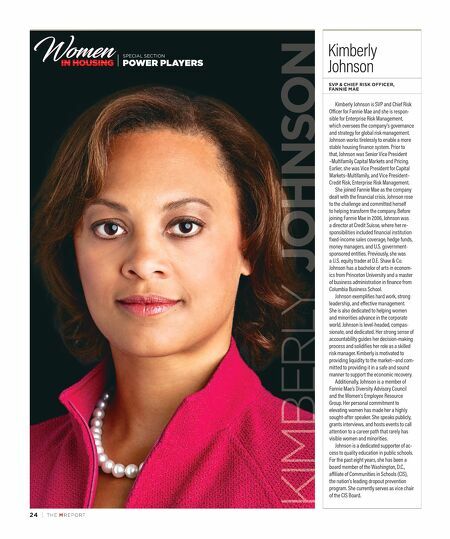 These 55 women all have the following in common: They are smart, driven, and innovative trailblazers who have caught the attention of not just their respective companies but the industry as a whole. While they may work in a variety of positions in different sectors of the industry, the common thread tying these women together is that they have all dedicated their careers to bettering the future of the mortgage and housing industries. Whether it's technology, government regulation, or other challenges yet to come, these women are eager to help tackle the trials the industry will face in the years to come. We'll be rooting for them every step of the way.